Not going to lie. Half of us "awww"ed uncontrollably when we saw this outfit come in. Seriously. Just look at it. How cute is that? Yes, we are well aware that owls aren't all fuzz and cuteness. That they are stealthy creatures of the night. Expert rodent-catchers with sharp senses. But that doesn't mean they aren't still cute! Not only are they amazingly fluffy with all those feathers, what about those big moony eyes? And did you know that a baby owl is called an owlet? And a group of them is a parliament? How adorable is that? From big poufy Great Horned owls, to little tiny Pygmy owls (they're adorable, look them up! ), owls are fantastic birds. So it makes perfect sense why you would want to dress up your cute little tykes as some cute fuzzy owls! Our Toddler White Barn Owl Costume is padded to give your kid that plump little owl look. There's arm holes under the wings, so your owlet can flap uncontrollably at will, and a hood with little beak and eyes. 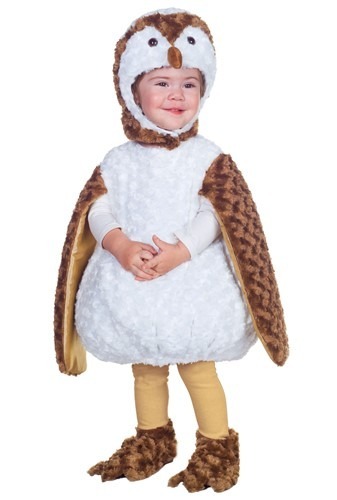 The costume even includes shoe covers so your baby owl can have little baby owl toes! Now all you need to do is train them to hoot on occasion. Maybe also train them to catch mice. That'd be neat. great quality, soft and warm for a cool Halloween day. my toddler loved it, wore the hat the whole day!